Are you searching unequalled deals on flights with the Etihad Airways? Then your search ends right here. Etihad is one of the leading airlines in the world that has been admired with various accolades for serving the diverse needs of the passengers with excellence. Since 2003, Etihad has expanded its operations in becoming the airline that has witnessed the fastest evolution in the history of commercial aviation. You will notice the Etihad difference the minute you embark on your journey. Any of the three guest classes you choose whether Diamond First, Pearl Business or Coral Economy. You will come across new levels of comfort and pleasure when you fly with Etihad. The airline has its major base at Abu Dhabi International Airport and caters to various destinations in the Middle East, Europe, Indian subcontinent, Far East, Africa, and Oceania from London Heathrow and Manchester. Etihad is loaded with a fleet of 66 aircraft that operates 1,000 flights per week serving a total of 84 passenger and cargo destinations in Asia, Europe, Africa, Australia, North America and Middle East. The airline aims to reflect the finest of Arabian hospitality. You can take delight in any of the three classes which exude a magnetic appeal. 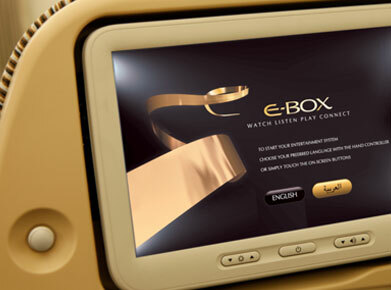 You can stay entertained on your flight with E-BOX, which is Etihad’s on-demand entertainment system. You can revive your senses watching the latest movies, TV shows, music and interactive games. What’s more? In addition, you can browse the CD library packed with more than 400 albums. Passengers flying in coral economy class are welcomed in a very gracious way as they are offered warm hospitality, personal attention and prize-winning cuisine that is bound to excite your taste buds. Flying with Etihad will let you discover why the most unmatched things in life don’t always come at a huge price. 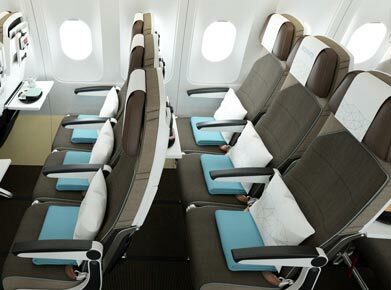 Etihad redefines the level of comfort and luxury provided to every passenger. You can grab a laid back experience as you relax in your wide cradle seat, which is one of the finest economy class seats in the airline industry. Choose from a wide range of food and beverage that comprise menus of up to 3 courses. What’s more? You can munch some hot desserts and cafe-style hot and cold beverages. Stay tuned with over 600 hours of on-demand entertainment that will enliven your senses with the latest movies, TV shows, music and interactive games. Pamper your children as you can keep them busy and entertained with ‘family pack’ that is filled with stickers, pencils, games and fun activities. Get your little ones aboard and spoil them with our various entertainment options. Those travelling overnight are provided travel packs with comfort items. Whether passengers are flying for business or pleasure, they are treated with utmost luxury as it is the most striking way flying in Pearl Business Class. It has been voted as the World’s Best Business Class by Skytrax 2009 and its 16 millions satisfied users. Flying in the most luxurious class let the travellers catch hold of a style and space that are provided in no other airline. Etihad’s inspired service concept provides first-class special treatment for the duration of business class flight. 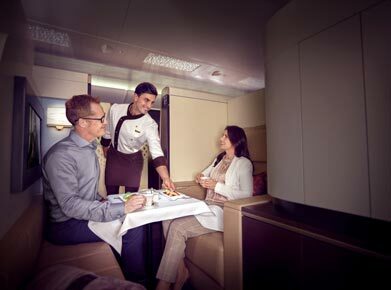 Etihad provides a privilege to its passengers to decide how and when they would like to be served during the course of their journey. You can look ahead to a laid back flying experience in plush business class flat bed seats equipped with 82-inch seat pitch and generous recline. Indulge in a pleasurable atmosphere when you fly in Pearl Business Class. Also, feel the sophistication when you step inside limousines. You can relax at the lounges and endure an intimate atmosphere on board. Plunge into a beautiful flatbed with a spongy pillow and a warm blanket. Experience the soothing mood lighting system that leads to a perfect atmosphere through your flight. What’s more? You can also create your own ambience getting your hands on a variety of personal lights and settings. Etihad has redefined luxury air travel as they bestow Diamond First Class travellers with individual suites, enhanced levels of comfort and more personal space never experienced before. You can grab an interactive tour of award-winning of the luxurious suite provided by Emirates. Take pleasure in flying in Diamond First Class with a complimentary chauffeur-drive. Get pleasure from the dedicated attention of your personal chef hired from the finest restaurant. Lie-down on flatbed seats which are upholstered with leather by world-renowned manufacturer Poltrona Frau, which supply Ferrari’s interiors. Savour the flavour and freshness of the finest ingredients that play a prime role while creating the dishes, which are taken care of by notable chefs. Keep yourself in the mood with E-BOX in-flight system that lets you catch hold of the latest blockbusters, ageless classics and the finest in interactive games. Grab pure privacy with sliding the screen doors. Relish a Swarovski Elements decorated cosmetic purse for women and a cufflink box for men that is incomplete with a La Prairie skin care product. 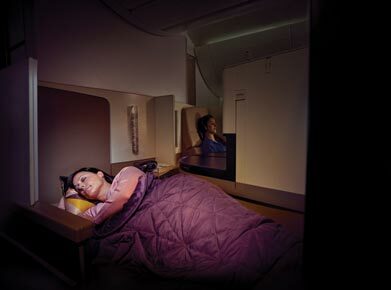 Create a different mood for sleeping, dining or relaxing with inflight mood lighting system. Passengers flying with Etihad have a privilege to divert their mind to on-demand entertainment system that will keep them absorbed in various categories of entertainment. Travellers can enjoy watching the latest blockbusters, TV shows, music and interactive games. Etihad has come up with big-screen entertainment into the sky of which the control lies in your hands. You would come across a wide choice of over 650 hours of entertainment on demand that comprises more than 90 movies. Tune-in to your favourite TV programme as you are bestowed with 180 TV titles to choose from. Explore the CD library packed with more than 400 albums. Let loose the child in you when you get the hands on 30-60 exciting interactive games. Remain in contact with your colleagues, friends and family right through the complete duration of your flight. Etihad Airways is the fastest growing airline in commercial airline history, with new routes added to their network regularly. 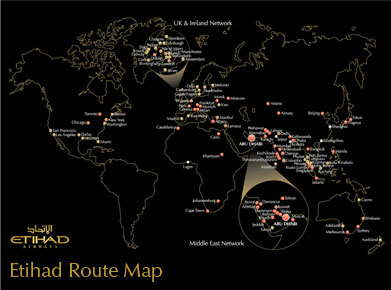 Etihad Airways operates 3 daily flights from Heathrow and 2 from Manchester to the worldwide destinations via Abu Dhbia.